Video marketing has become a vital part of digital marketing ever since video sites such as YouTube conquered the world. Videos have a huge impact on customer behavior. They shape who we are and also very much determine what we buy and where we buy it. Product placement has become crucial and video marketing is a wonderful way to enhance your customer reach. Videos can be published on sites like YouTube but also on social media sites. It is important that we make use of all platforms that are available on the market. Go2marK helps you reach existing and new customers with video marketing that understands your market and market group. What does Go2marK do for you? Before taking on your video marketing project we determine what your goals are. Are you promoting products/services or providing educational information? Releasing company culture or 'how to' videos? Go2marK will set up, manage and maintain your video marketing campaign from start to finish. SEO Long term strategy that brings you highly relevant visitors from Google, Yahoo! and Bing. PPC Get relevant visitors with Google, Bing & Facebook advertising. Great long and short term strategy. SMO Engage with customers and promote products and services on great social media platforms such as Facebook and Twitter. WEB Responsive web design looks fantastic on all devices. Make your visitors feel at home wherever they are. EM Market your customer base with great looking emails. VM Attract new customers by promoting your videos. RM Protect your brand & reputation from online comments and remarks. SA We write an extensive report detailing the good, the bad and the ugly of your website. Every business has different needs and priorities when it comes to digital marketing. By prioritizing your digital marketing efforts we will obtain the best return on investment. Go2marK helps you find, connect and engage with customers by using an internet marketing service that helps you move forward. 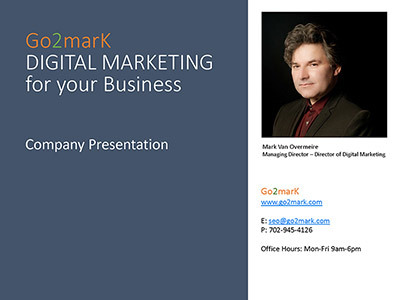 Download Go2marK's company presentation with an overview of our digital marketing services and see how we can help your business. Why should you choose Go2marK as your digital marketing agency?